N HIS LONG CAREER as a silhouette artist Charles Burns has cut many notable portraits, including two silhouettes of the Queen. He is the UK’s busiest silhouette artist, working at a huge variety of events at home and overseas. 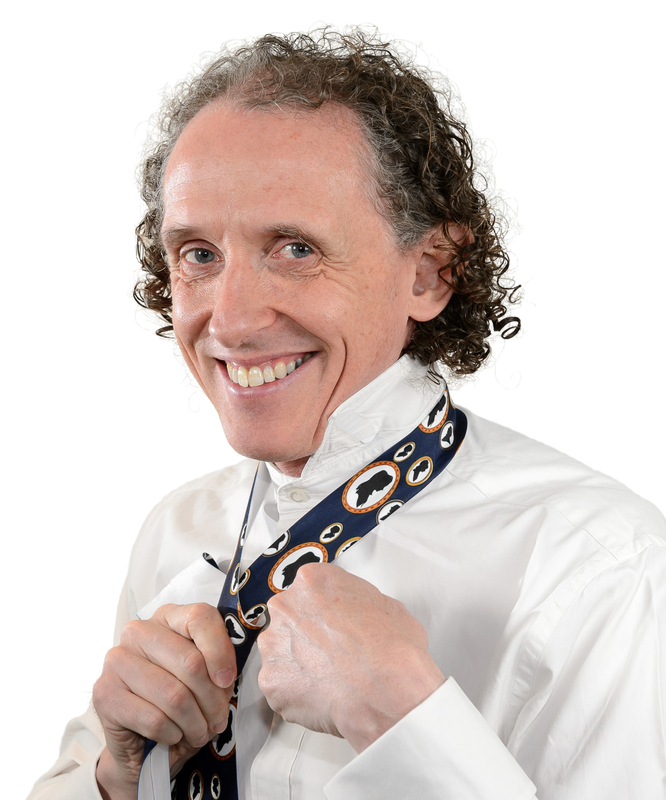 Charles was born in London in 1961 and educated at Ampleforth, a Catholic boarding school in North Yorkshire. Here he was taught to draw in the classical tradition by the sculptor John Bunting, a student of Leon Underwood. Charles attended art colleges in Exeter, Wolverhampton and Lyon, France, graduating with a 1st-class Hons degree in Fine Art (painting) in 1984. On leaving art college he worked for many years as a street artist in London’s Covent Garden. He started by drawing 10-minute portraits in pencil and later began cutting silhouettes. He moved naturally from Covent Garden into corporate events, where he found a very different audience to the world of fine art. In his long career he has appeared at all kinds of venues and cut over 150,000 profiles, including two portraits of the Queen, the Duke of Edinburgh, President Clinton (while visiting the National Portrait Gallery) and a ever-growing number of TV personalities, writers, artists and sporting celebrities. Charles Burns currently lives with his family in Reading, where he has converted a small eighteenth-century barn for use as a painting studio. Mays Barn doubles as an ad-hoc gallery and is opened to the public on various occasions each year. “In one way or another I’ve spent my whole life drawing people. As a shy and awkward 1970’s teenager drawing was the one thing that seemed to connect me with others. It allowed me to commit to paper my feelings about them, my fascination with their varying characters and my own relationship to them. From an early age my ability to draw enabled me to make friends and helped me define my sense of self. In many ways, it still does. The activity of drawing can take many forms. My favourite (reflecting the way I was taught) is to use a 3B pencil on paper. Today, after many happy years spent cutting silhouette portraits, this is closely followed by a pair of scissors. Whether drawing or cutting I always begin by just looking, and then allowing my hands to respond naturally to what I see. When working fast with scissors this approach can sometimes produce unexpected results! Some cuttings by Charles Burns, including full-lengths, half-lengths, a variety of party-goers holding glasses, and his well-known signature cut: a double face-to-face portrait cut from a single sheet of paper. Charles’ latest silhouette-based project is a film made in partnership with Andi Reiss. 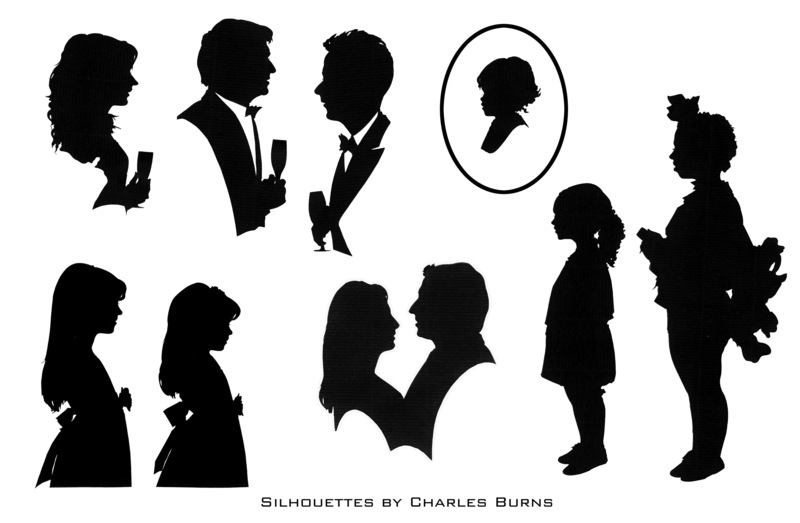 More information, and some clips of Charles in action, can be found on the Silhouette Secrets Facebook Page. Silhouettes are all around us, although you may not have noticed this. Look carefully: you can see them in posters, on the side of buses, in instruction manuals, all over the internet, on book jackets and cereal packets. Designers love them because, with just a simple outline, they evoke the immediate presence of a real individual without swamping us with irrelevant detail. They draw us in, creating a sense of the familiar, while at the same time receding – quite literally into the shadows – leaving us to concentrate on the main message of a design. 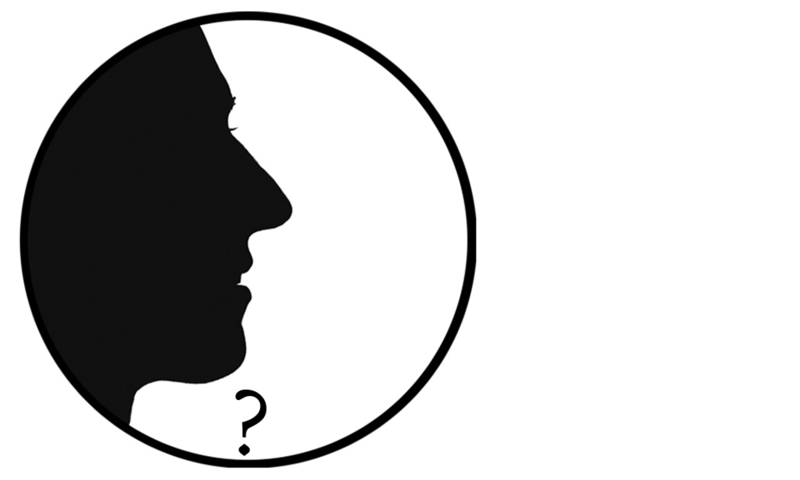 But what exactly is a silhouette? Why do they entice us so? Where do these strange black images come from?